Review by AllTheBestFights.com: 2017-04-08, some good exchanges between Cristian Mijares and Tomas Rojas 2 but it is not enough to get three stars: it gets two. The former Wbc, Wba and Ibf champion Cristian Mijares entered this fight with a professional record of 55-8-2 (26 knockouts) and he is ranked as the No.18 featherweight in the world. ‘El Diamante’ Mijares suffered his last defeat when he faced Leo Santa Cruz in 2014 (=Santa Cruz vs Mijares), since then he has won six bouts beating Andres Gutierrez (=Gutierrez vs Mijares) and Shohei Kawashima in 2016 (=Mijares vs Kawashima). His opponent, the former Wbc super-Flw champion Tomas Rojas, has a boxing record of 48-14-1 (32 knockouts) and he entered as the No.29 in the same weight class. He lost to Shinsuke Yamanaka in 2012 (=Yamanaka vs Rojas) but then he has collected nine victories. 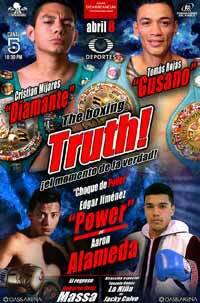 In their first bout Mijares beat Rojas via unanimous decision (March 12, 2004); Cristian Mijares vs Tomas Rojas 2 is valid for the WBC Silver featherweight title. Watch the video and rate this fight!